Please join us in congratulating all of the finalists in this years Oticon Focus on People Awards. We are especially proud of our long time patient Mala Bawer for being selected as a finalist. Mala shares a passion for making the world a better place for everyone. Please read her story below then click on the link to cast your vote for Mala. Mala Bawer, who has lived with hearing loss for more than 30 years, understands the ways that technology — in the form of hearing aids or digital resources — empowers life-changing possibilities. Co-founder of CyberSmart Education, she is passionate about the importance of fostering digital literacy. She pioneered the development of the first digital literacy curriculum now modeled internationally. Her initial work in Sub-Saharan Africa inspired Mala’s production of the internationally acclaimed feature film TALL AS THE BAOBAB TREE. Today, Mala and the CyberSmart Africa team work in partnership with the Senegalese Ministry of Education and The Earth Institute at Columbia University tackling the challenge of delivering a 21st century education to millions of youth in Sub-Saharan Africa with extremely limited access to school books. Mala’s team is piloting an innovative digital learning platform to deliver up-to-date learning and teaching resources to schools across the developing world. Please join us for an open house July 18-20, 2017 featuring Oticon’s newest hearing aid the Opn. As mentioned in our previous post about Oticon hearing aids Oticon just released new features and new hearing aids to compliment their Opn line: A mini RITE with telecoil, a rechargeable hearing aid and a power behind the ear hearing aid. The telecoil feature allows for easier communication over a landline telephone and enables the user to hear better in a looped environment such as a theater or house of worship. The new power hearing aid – OPN BTE 13PP – is a power plus hearing aid meant for people with severe to profound hearing loss and also includes a telecoil. Lastly, Oticon released a new rechargeable kit for use with the OPN mini RITE hearing aid. No more changing batteries! A single over night charge can provide up to 19 hours of use. If you currently use the OPN mini RITE hearing aids they can easily be converted to use rechargeable batteries. What a great option for our patients with dexterity issues or for those who would rather not change the batteries weekly. To find out more about these great new devices call our office at 973-542-4031 to schedule your complimentary hearing consultation and demonstration. Oticon added 2 new hearing instruments to their new OPN line – A mini RITE with telecoil and a power behind the ear hearing aid. The telecoil feature allows for easier communication over a landline telephone and enables the user to hear better in a looped environment such as a theater or house of worship. The new power hearing aid – OPN BTE 13PP – is a power plus hearing aid meant for people with severe to profound hearing loss and also includes a telecoil. 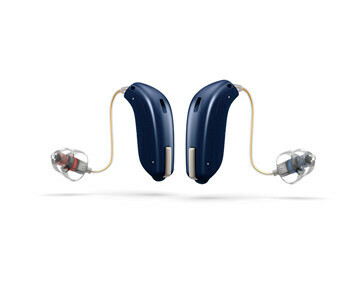 Lastly, Oticon released a new rechargeable kit for use with the OPN mini RITE hearing aid. No more changing batteries! A single over night charge can provide up to 19 hours of use. If you currently use the OPN mini RITE hearing aids they can easily be converted to use rechargeable batteries. What a great option for our patients with dexterity issues or for those who would rather not change the batteries weekly. To find out more about these great new devices call our office at 973-542-4031. During the summer months The Hearing Group will be closed on Saturdays. We continue to be in the office Monday, Tuesday, Wednesday and Friday from 9:00 AM – 5:00 PM and Thursday from 9:00 AM – 12:00 PM. Saturday hours will resume on September 9, 2017. As if being made for iPhone wasn’t enough, Oticon just added some new hearing aids to their product line. New additions to Oticon’s Opn line include a rechargeable option for the mini RITE hearing aid, a built in t-coil for enhanced hearing on the telephone and in looped environments and a power behind-the-ear hearing aid for severe to profound hearing loss. Please give our office a call at 973-542-4031 to find out more about these amazing hearing aids. On Monday May 29th The Hearing Group’s office will close in observance of Memorial Day. We join with the rest of our country in honoring the sacrifice of those who have given their lives in service to America and thank those currently serving domestically and abroad. West Orange, NJ, May 15, 2017—The Hearing Group is urging women of all ages to talk hearing health with their doctors—a topic often overlooked in the discussion on women’s health. Studies link unaddressed hearing loss to other serious health issues, including depression, dementia, diabetes, cardiovascular disease, moderate chronic kidney disease, rheumatoid arthritis, sleep apnea, and an increased risk of falls and hospitalization. Research also shows that when people address hearing loss, it often has a positive impact on their quality of life. During National Women’s Health Week, The Hearing Group invites people in for a complimentary hearing screening to determine if they need a comprehensive hearing test by one of our hearing healthcare professionals. Hearing loss affects women of all ages. About 1 in 13 women in their 40s say they already have hearing difficulty, according to BHI research, along with 1 in 10 women in their 50s, and 1 in 8 in their 60s. The numbers rise sharply from there, but across all age groups, about 1 in 11 women (18 and older) have hearing loss, BHI research indicates. The good news is that when women address hearing loss, they tend to see improvements in their quality of life. In fact, most women who wear hearing aids say it’s true. They see a notable improvement in their overall quality of life, their overall ability to communicate and participate in group activities, and they’re especially likely to see improvements show up at work—specifically, in their work performance and relationships. What’s more, most women who buy hearing aids say they’d recommend them to a family member or friend with hearing problems. That includes women who buy them in middle age (40-59). At least 90 percent of women in this age group say they would recommend them. Women of all ages even say they’re happy with the look of their hearing aids—at least 8 out of 10 female hearing aid users surveyed said so. The reality is, most people tend to address hearing loss in stages. They may notice they’re having difficulty hearing but not do anything about it, or they may start down the road to find information about hearing loss and treatment options. It’s important for women to know about the tremendous advances in hearing aid technology in recent years. Given that there is so much emerging research on the connection between hearing loss and other significant health issues, it makes sense for people to talk with their doctors about hearing loss sooner rather than later. Women have so much to gain by addressing their hearing loss early. And so do the people in their lives. Not only do 94 percent of women make healthcare decisions for themselves, but 59 percent of all women—whether or not they’re married or have children—make healthcare decisions for others as well, research from the Center for Talent Innovation shows. Given the wide circle of influence that women have, when a woman takes hearing health and hearing loss seriously, it has the potential to benefit many others too. During National Women’s Health Week, The Hearing Group is urging all women to talk hearing health with their doctors. National Women’s Health Week is an observance led by the U.S. Department of Health and Human Services Office on Women’s Health. This year’s National Women’s Health Week kicks off on Mother’s Day, May 14, and runs through May 20, 2017. Did you know that May is Better Hearing and Speech Month? This campaign was started in order to raise awareness of hearing loss and communication disorders. Did you know that 37.5 million adults in the United States say they have hearing loss. That’s 15% of the population! Did you know that untreated hearing loss can lead to social and emotional isolation and put stress on your relationships? Signs that you may have a hearing loss include: difficulty hearing conversation in noisy environments such as a restaurant, you feel that people are mumbling, people often have to repeat what they have said to you, you have trouble following conversations and you have noises in your ears such as ringing, buzzing or hissing. If you have any of these signs you may have hearing loss. Everyone over the age of 50 years should have their hearing tested annually. Please call our office at 973-542-4031 to schedule your appointment for a hearing test. The test is easy, quick, painless and is covered by most health insurance companies.